Proposed Development, 1920 N. Milwaukee Ave.
BUCKTOWN — A plan to bring a 50-unit transit-oriented apartment building to a blighted patch of Bucktown next to the CTA Blue Line Western stop got a warm reception from members of a neighborhood group's development committee on Saturday. "If there is any place for a tall building, it's right there," said Philip Edison, chairman of the Bucktown Community Organization's Zoning and Planning committee, which met with developers Kyle Glascott and Chris Ilekis at The Map Room on Saturday to discuss the triangular-shaped empty lot at 1920 N. Milwaukee Ave., on the southeast corner of Milwaukee and Western avenues. 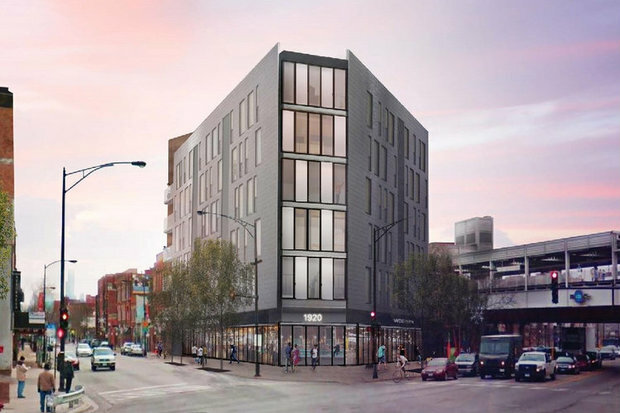 Less than 150 feet from the CTA Blue Line Western Station, the proposed 6-story apartment building, designed by architect David Brininstool, would be anchored by 5,800 square-feet of retail on the ground floor, likely divided into two stores, Glascott said. Glascott said no retail tenants have signed on yet but the goal would be to bring in options that fit with the transit hub consisting of a bus and "L" stop and a ramp to the elevated Bloomingdale trail, just one block south. "It's blighted. We want to re-establish that corner, offer something that fits," Glascott said. The group is seeking an "up-zone" to allow for retail and residential use. Across from a recently remodeled McDonald's, the spot was most recently home to a title and loan company. The complex would offer only 10 parking spots with two of those 10 spots reserved for car shares like Zipcar. Under the 2013 Transit-Oriented Development Ordinance, a real estate developer can offer fewer parking spots if a new residential project is located near public transit. The ordinance has sparked a flurry of new buildings that offer as many as 99 apartments, with no dedicated parking, an issue that has divided neighbors. The unit mix would be 35 one-bedroom apartments and 15 two-bedrooms, with an average unit size of 755 square feet. Amenities in the glass and steel building would include a bike storage room, green roof, fitness center, lounge and terrace. The project's zoning attorney Andrew Scott would not comment on whether affordable units would be offered onsite, but confirmed that the group plans to file its application for a zoning change this week before the new Affordable Housing requirements go into effect on Oct. 12. "We want to make sure we are under the current ordinance," Scott said, referring to the existing ordinance, enacted in 2007, which requires that certain new buildings over 10 units either allocate 10 percent of units as affordable housing or pay $100,000 per unit to a city-managed trust fund that helps to develop low-income housing elsewhere. In October, 25 percent of those 10 units — 3 this particular project — would need to be allocated for affordable housing and the per-unit fee for "opting out" of offering onsite affordable housing would increase to $125,000 per unit. Sam Marts, an architect and member of the Bucktown group, said he supports the developer's decision to get their zoning change application filed under the existing ordinance. "It's disingenuous for the city to require affordable housing when there is no such thing as affordable construction," Marts said. Paul Sajovec, a spokesman for Ald. Scott Waguespack (32nd), who was not at Saturday's meeting, told DNAinfo Chicago last week that there would be more community meetings to discuss the project. 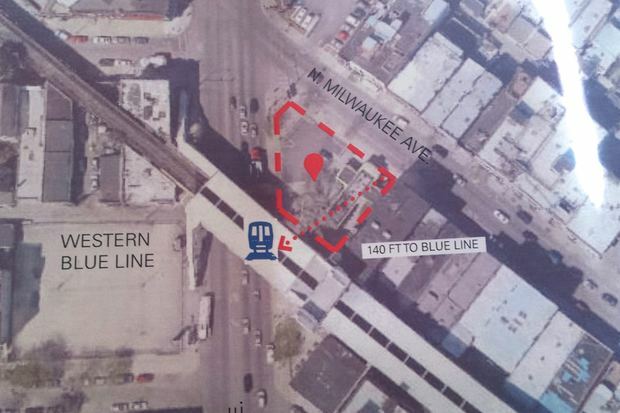 "There's no question that it's an important site, a important corner near an "L" stop. We were looking for something that presented more of an urban look to that block. They are headed in the right direction," Sajovec said. If everything goes as planned, Brininstool said construction would begin in the summer.